The "New Band To Burn One To" today is Silver Devil. This straight up Stoner Rock band from Sweden started off by playing Fu Manchu covers which eventually lead to writing their own songs and ultimately playing their local clubs. The band has released a few demos including their EP 'Follow Me Down" released in 2008. Following is a review of their 3-song demo released in 2009. Look for the band to release a full-length in November 2010. Until then they will be gigging extensively, so check'em out! "The Ampire strikes back and the guys from planet groove have returned with yet another chunky piece of meat, not quite as brilliant as the previous demo but it still has great potential to knock down most of its kind! I believe that these earthlings are quite young, which is quite impressive according to their musical skills, they can go on forever if they manage to keep the same high standard as they have done so far. 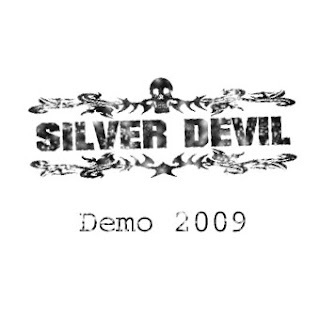 On the new demo I personally think that Silver Devil are holding back some of the brilliance that they previously showed up, but as i said before they are still far from being a mediocre band. Silver Devil are one of the bands who still know how to handle a fuzz pedal in the right way... these Swedes simply rule and gives the listener a one hell of a ride! The latest three track effort by the Swedish fuzzoholics is like being run down by some rampant trucker on meth, you get truckloads of fuzz and piles of everything that stoner rock is all about and these animals are without any doubt comparable to bands like Dozer, Truckfighters and Fu Manchu. Silver Devil are true 'skirtlifters' who make any chick wanna ride the 'golden horse' and are a threat to all who think that Queens and Aerosmith are tough enough. The third track 'Lies' along with the opening track 'Cactus Kicker' are absolutely the outstanders on this demo which makes me wanna deepdive in joy into my neighbours bed (forgetting that she's an 80 year old hag). Thank God for Swedish bands keeping the Stoner Rock dream alive. Too bad we have to wait until November for a full-length. Well, at least we have something to look forward to in 2010, this is just a little taste to wet our appetites. Great Tunes! Is there anyway to get their demo? Theie Myspace page didn't mention anything. QUITE AGREE, HOW DO YOU GET THE DEMO. IT SOUNDS KILLER.